Discussion in 'Off Topic' started by Accelerator, Apr 14, 2019 at 2:31 PM. I am a proud man. It had been a long time, but I still remember that Nil and I were once enemies that faced each other in opposite sides of a battlefield. The frozen earth beneath our feet were filled with the scars of our previous attacks against each other. Various discarded weapons from different time periods and cultures were scattered around us- silent spectators to the duel that was coming to a close. He is the king of kings, the owner of the Gate of Babylon, possessor of the ultimate expression of overwhelming force. Hurling wave upon wave of projectiles upon my person, his attacks were relentless and domineering. It didn't matter how many weapons I reflected away with my ability, for there was always more that followed after. "You are a treasure, and I own all treasures. It's obvious that you belong to me!" That was his statement when our duel began. I thought that he wasn't serious, that it was just another pick-up line among the plethora of phrases that he could say so that I'll let him hug me. Yes, you didn't read it wrong. The reason for this grand battle of epic proportions was because I was too stubborn to let this golden man embrace me. You think I should have simply given way and let him do what he wanted? No. My name wouldn't be Accelerator if I were such an easy pushover. Let me say it again: I am a proud man. I patiently waited for his treasury to run dry, similar to how Enkidu once outlasted his attacks in the Epic of Gilgamesh. Upon seeing an opening, I immediately rushed forward and aimed my fist at his exposed abdomen. There was no resistance. Nil didn't even attempt to dodge or defend himself. My punch went through and cleanly pierced his stomach. Blood and guts freely flowed out from the hole in his torso right after I pulled out and retracted my hand. It was too late when I realized that it was what Nil had planned right from the beginning. The fool. He had successfully hugged me: at the cost of his life. With the last of his strength, Nil softly brought me to his embrace and held me in place like the treasure which he said I was. There was no animosity in his smiling face, only the pure happiness of someone who had accomplished what he had set in his heart to do. I couldn't just let him die in peace like that. Like I said: I wasn't just some pushover! 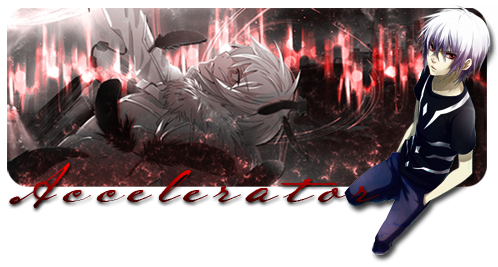 I am Accelerator. He has one-upped me and he thinks he can get away with it? "Oh, Nil, Nil, Nil. I'm never going to let you die. I won't ever let you rest. Your suffering shall be eternal. For every time you shuffle off the mortal coil, I'll gladly reset the world. That will be the price for the hug which you stole." Three years had passed since then. The friendly competition which we've once had gradually evolved into something else. We even got married to the same woman! Fate really has a weird way of bringing together people, sometimes in the most unexpected of ways. Due to certain recent events which I will not bother explaining in this narrative, I have found myself in possession of a dimunitive feminine body of a child. Being in it made me a target of pats from some of the users of this forum. And Nil was one such user. His patting needed to be punished! Wrapping my small hands upon Nil's stury arm, I bit down with as much force as my teeth could muster. But for some unknown reason, he found act amusing instead. With a hearty chuckle, he raised the bleeding arm which I was still clinging upon, and carried me home where Hakuno waits with Nil's freshly-baked birthday cake. Coffee, Project, Celeste and 14 others like this. Zeroth and Accelerator like this. "Yes, you heard me right, this battle of epic proportions started because im too stubborn to give a sad, poor, average, uninteresting, normal man a hug." Happy birthday Nil, may much fortune and treasure come your way. The ultimate expression of bitterness because he burned your cheesy dominion. Ahaha. Coffee and Zeroth like this. Originaly i just wanted to simplify the sentance, but then i realized true comedy. This is just so beautiful and lovely, I think this is some good stuff! You did some very good work. Two years without real signature... But wait! There's more years to come! Celeste, Zeroth and Accelerator like this.